One of the most beautiful times to go camping in Virginia is the Fall. There is something about the slower pace, the color of leaves, and the smell of Autumn in the air that appeals to a whole segment of campers. There is plenty to do and see, whether you are traveling along the shore or prefer to stay inland. Wine lovers can find something in every region of VA. Since October is Wine Month, what better time than this to make those reservations. You might like to stay in a cabin at one of our member RV parks and campgrounds as you hopscotch around the area for wine tastings and vineyard tours. 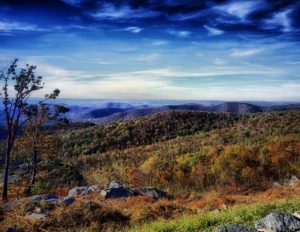 Halloween camping enthusiasts will love it in Virginia. You can stay at one of our Halloween loving member parks and enjoy their festivities and also visit events in your area. Virginia hosts plenty of corn mazes, pumpkin patches, and ghost tours. You can find scary and not-so-scary activities to suit your crew as you explore. There are always our historic sites, theme parks, zoos, and plenty of shopping. Be sure to make your plans for Fall camping in Va this year. It will be an adventure you will want to repeat.